Storm Team4's Lauryn Ricketts forecasts snow and rain for Thursday, including during the evening commute. And Lauryn's Moon Boots make an appearance! A winter storm warning has been extended into upper Montgomery and eastern Loudoun counties through 4 a.m. Friday. The warning is also in effect for the Shenandoah Valley until 4 a.m. Friday. Areas under that winter storm warning could see 3 to 5". In Maryland, state police responded to 97 crashes and 14 disabled vehicles between 6 and 10 a.m.
UPDATE: This story is no longer being updated. Please check here for the latest forecast. A wintry mix of snow, sleet and rain is falling in the D.C. area on Thursday, leaving roads slick and spurring closures by some of the area's largest school districts. A winter storm warning — already in effect for the Shenandoah Valley until 4 a.m. Friday — has been extended into upper Montgomery and eastern Loudoun counties. Areas under that warning could see 3 to 5 inches of snow, along with some ice accumulation from freezing rain. This could lead to some power outages and slick travel conditions for the I-81 corridor. Flood watches are in effect through Thursday evening for D.C. and parts of Maryland and Virginia. Check here for a full list of weather alerts. Sleet started to fall across the region early Thursday morning, leaving some grassy areas coated. 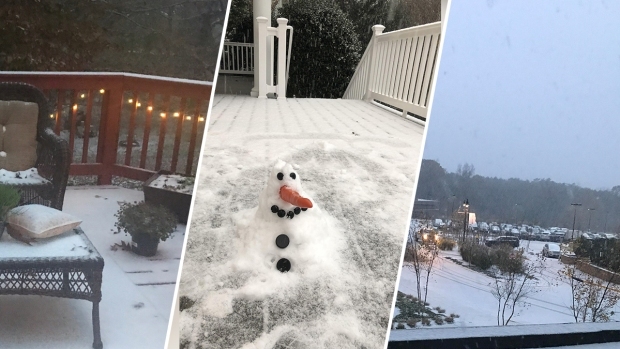 Snow was especially heavy west of D.C., including in Frederick, Leesburg and Winchester. As much as 4 inches of snow were reported there. In D.C., 1.4 inches of snow had fallen by 1 p.m. That's the most the city has seen in all of the month of November since 1989. 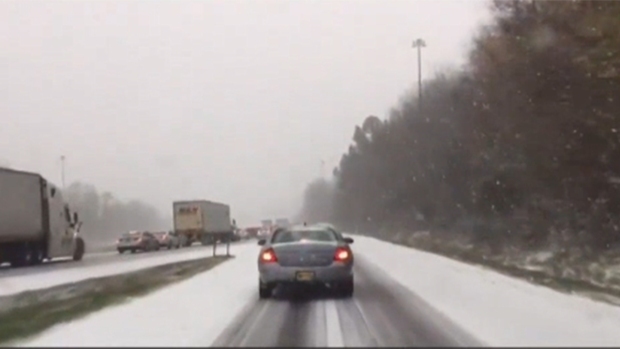 In the D.C. metro area, rain, sleet and some snow made for a slushy commute in some spots. Here's how much snow fell in the D.C. area on Thursday as of 1 p.m.
A number of car crashes have occurred across the region. A 27-year-old driver was killed early Thursday after he lost control near Route 218 in Fredericksburg. Road conditions were a factor in the death of David M. Lenox, Virginia State Police said. All lanes of Interstate 70 East west of Braddock Road in Maryland were temporarily closed early Thursday afternoon due to ice on the roadway, although one lane had reopened as of about 2 p.m. State police said several vehicles were disabled or jackknifed. The State Highway Administration was in the process of treating the road surface. Federal offices in D.C. are open Thursday, but employees were given the option to take unscheduled leave or telework. Public schools are closed Thursday in Fairfax, Fauquier, Loudoun, Montgomery, Prince William and Rappahannock counties. Fairfax and Montgomery counties initially operated on two-hour delays but then closed schools entirely. School was delayed by two hours in Culpeper and Stafford counties. In Charles County, schools will dismiss one hour early because of anticipated flooding and inclement weather. Check here for a full list of school closings and delays. As the day goes on, expect the sleet and snow to turn into rain, possibly heavy in spots. "This is going to be an all-day event, with that mixed sleet and freezing rain," Storm Team4's Lauryn Ricketts said. The weather is looking a lot more mild for Friday and the weekend. It's set to be dry Friday, with a high of 50 degrees. Then, a high of 52 is expected on Saturday, and 50 on Sunday. "Roads that are slick or ice-covered can create a worst-case scenario for commuters. The first rule of safe driving during wet weather is to slow down to improve tire traction. Plus, given the darker morning and evening commutes, be especially cautious and look out for pedestrians," AAA spokesman John Townsend II warned in a statement. If you miss out on this round of snow, don't worry. Storm Team4 predicts double the average snowfall for most of the region for the season. A wintry mix Thursday morning made for a slippery commute in some parts of the D.C. area. "I was just surprised that there's actually ice on the actual road," said commuter John Matthews. "I expected to see rain as I came into [Interstate] 270."